The Devon Boathouse on the Oklahoma River. A party on the Oklahoma River in the Oklahoma City Boathouse District. The Oklahoma Regatta Run is a new edition to the festival this year. The 2011 OKC Boathouse Blu Party on the Oklahoma River. 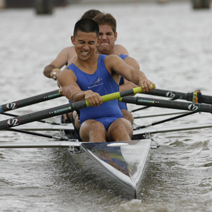 The Oklahoma Regatta Festival will take place Sept. 27-30 in the Boathouse District on the Oklahoma River. The annual celebration of rowing, paddling and family fun has become a tradition that brings thousands to the Oklahoma River. This year’s event will include the Oklahoma City University Head of the Oklahoma, blu VIP Party, OGE NightSprints, a family festival, and new for this year, the Oklahoma Regatta Run. The festival begins with OGE NightSprints on Thursday, Sept. 27, 6 p.m. to 10 p.m. More than 40 corporate rowing and dragon boat teams will race in the 500 meter OGE NightSprints. The evening will begin with Paddle for the Cure, a dragon boat race benefiting the Susan G. Komen of Central and Western Oklahoma Affiliate. Teams of 20 people can sign up now to race in Paddle for the Cure. Learn more at headoftheoklahoma.org. The OGE NIghtSprints continue Friday, Sept. 28, 6 p.m. to 10p.m. with OKC RIVERSPORT Corporate Rowing League 500 meter races and 200 meter canoe/kayak super sprints. The annual OCU Head of the Oklahoma will start Saturday and will feature more than 1,000 athletes from across the nation racing in 2.5 mile head racing and the OGE NightSprints Saturday evening. Head of the Oklahoma racing concludes Sunday morning, 8 a.m. to noon. Each evening will end with a fireworks show over the Oklahoma River. Festival activities will be open Thursday and Friday evenings, and Saturday, 10 a.m. to 10 p.m. RIVERSPORT Adventure activities during the festival include face painting, rock climbing, kayaking, stand up paddle boarding, inflatables, and the new Extreme Air stationary jumper. RIVERSPORT Adventure Saturday passes are $10 for adults and $5 for youth ages 4-12; children ages 3 and under can play for free. Children and adults will also be able to try various Olympic and Paralympic sports at the Olympic Experience. This free, interactive exhibit will feature rowing, kayaking, gymnastics and cycling. Other festival attractions available on Saturday include a pumpkin patch, outdoor market, live entertainment, food vendors and a beer and wine garden. Registration is now open for the Oklahoma Regatta Run, a 5K race on the Oklahoma River Trails. The race begins at 4 p.m. Saturday at the Chesapeake Finish Line Tower. The $25 entry fee includes a t-shirt and medals will be awarded in age groups. Participants can register for the run online at headoftheoklahoma.org. Saturday night will also include the blu VIP Party presented by Devon Energy. Themed blu Galaxy, this year’s event will feature delicious food, drinks, and live entertainment. Tickets are $75 each and proceeds support youth athletes and Olympic hopefuls on the Oklahoma river. Tickets are available online at blu2012.org. The Boathouse District is located at S.E. 6th St. and Lincoln Boulevard. For more information on the Oklahoma Regatta Festival, visit headoftheoklahoma.org.